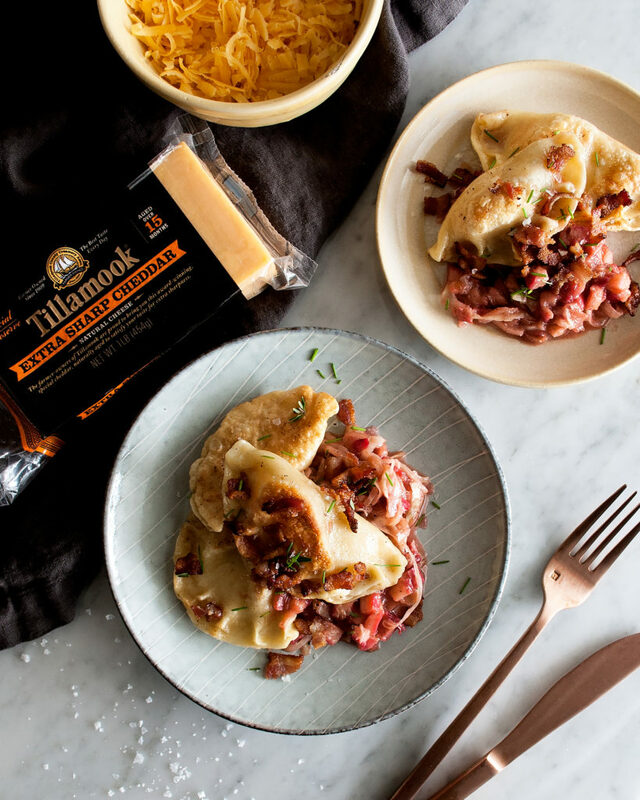 Tillamook is now available nationwide, and I could not be more excited! 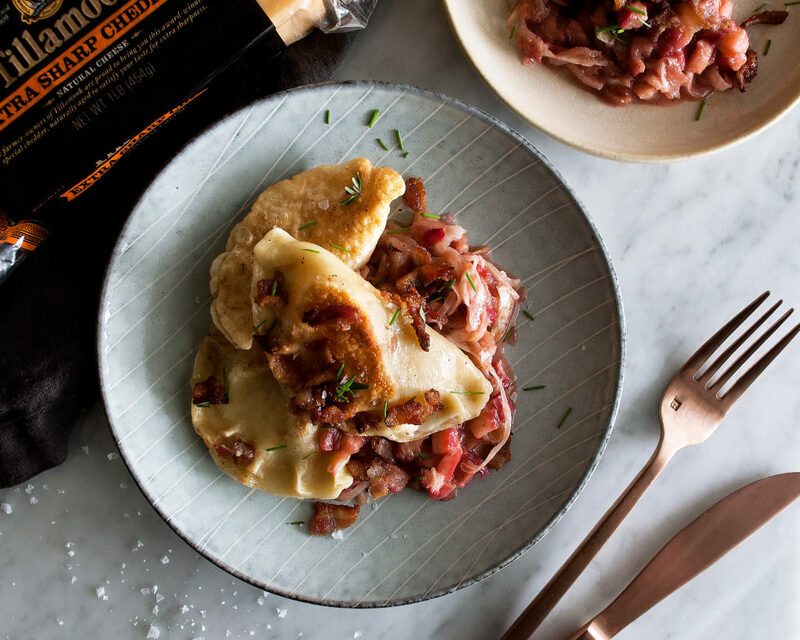 I’m celebrating with these cheddar & sauerkraut pierogies, because why not?! In honor of this very, very exciting Tillamook expansion news, I’ve created a really special dish that celebrates where I’m from: the Midwest. 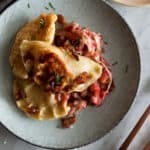 Pierogies are popular in Midwestern cities such has Chicago (where I live), Detroit, and Minneapolis because of their large Polish populations. It just so happens that my grandma, or “Busia”, is Polish and has been making pierogies for our family ever since I can remember. 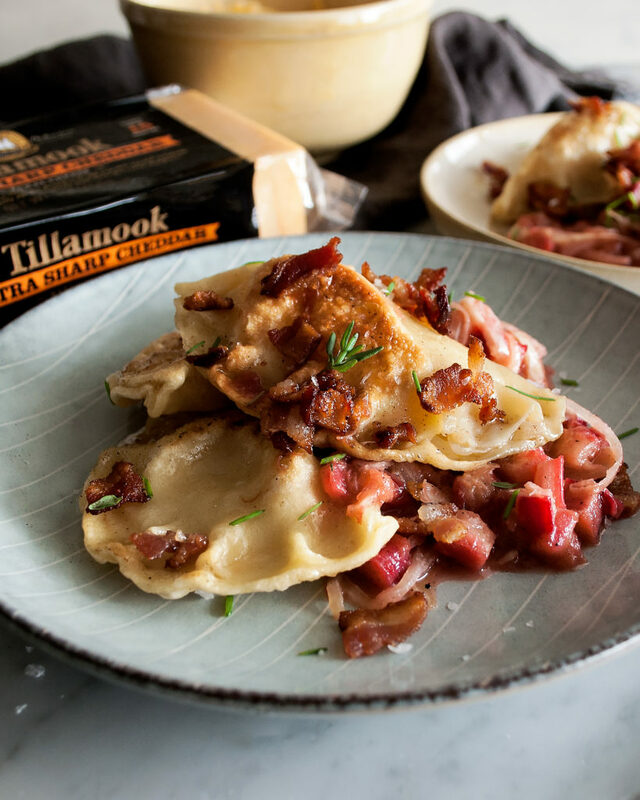 When the idea hit me, I immediately pulled up her classic pierogi recipe and got to work. Now, she usually makes three versions – a cheese, potato, and sauerkraut. When I told her I wanted to incorporate cheddar cheese, she was definitely skeptical. But, I started testing and re-testing and soon discovered the perfect little cheddar & sauerkraut pierogi. And I LOVED it. 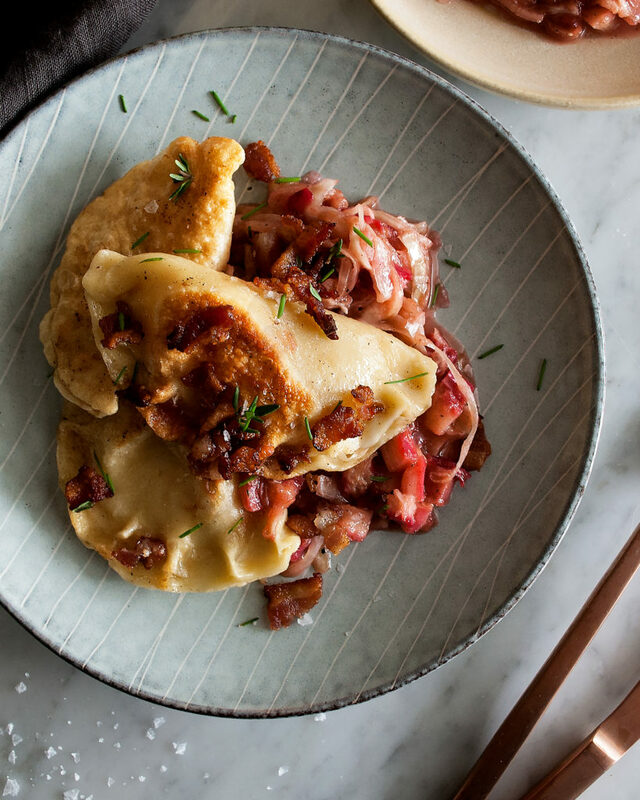 The dough is really what makes these pierogies special. Busia’s secret addition is a little bit of sour cream, which adds to the texture of the dough. Everything gets combined and comes together really easily with just a few minutes of kneading. The dough rests for about 20 minutes before getting rolled out, filled, shaped, boiled, and seared. 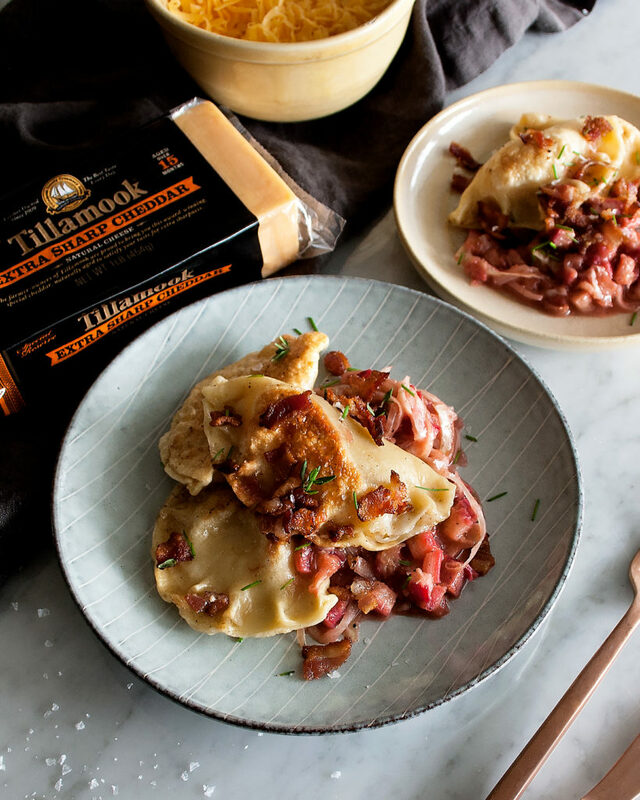 I basically combined Tillamook’s Special Reserve Extra Sharp Cheddar Cheese (which is completely natural and made with the highest quality of ingredients…YES) with a really flavorful sauerkraut mixture to create a really tangy, bold filling. After rendering bacon in a cast-iron skillet, I seared the boiled pierogies right in the hot bacon fat. Crispy and delicious. And to pull the whole dish together, I made a quick bacon rhubarb relish with some of the extra sauerkraut. It turned out to be sweet, tangy, and the perfect accompaniment for the pierogies. 1. Knead the dough until completely smooth. This should just take a few minutes, but use your eyes and the feel of the dough to judge when it’s ready. 2. Don’t skip the resting process. This allows the dough to really come together. 3. Make sure to use a light amount of flour when rolling out and shaping the dough so that it doesn’t stick. 4. Keep whatever dough you’re not working with wrapped in plastic wrap so that it remains pliable and does not dry out. 5. When crimping the dough, first use a bit of water so that the dough easily seals. 6. Make sure not to over-boil the pierogies or the dough will stiffen. When the pierogies float to the top, they’re done. Next time Busia is over, we’ll be making these together. I know she will just love this cheddar variation! Drain the sauerkraut in a colander and rinse well with cold water. Bring a large pot of salted water to a boil. Add the sauerkraut, reduce the heat to a simmer, cover the pot, and let cook for about 45 minutes to an hour until tender. Drain the sauerkraut again and let cool slightly. In another pot, melt the butter over medium heat. Add the onions and let sauté until tender and slightly caramelized, about 8 minutes. Squeeze the sauerkraut to really get the water out and add it to the onions. Let the sauerkraut “fry” in the pan for just about 10 minutes. Season the mixture with a good amount of salt and black pepper. Let cool. Pour the flour into a mixing bowl. In a separate bowl, whisk the eggs and sour cream until smooth. Whisk in the water. Pour the wet ingredients into the flour and stir to combine. Gradually add more water as needed, stirring until the dough comes together. Turn the dough out onto a well-floured surface and knead until smooth, just about 4-5 minutes. Shape the dough into a ball, wrap in plastic wrap, and let rest at room temperature for 20 minutes. Remove the dough from the plastic wrap and cut it into 4 pieces. Work with one piece at a time and keep the rest of the dough covered. Roll the dough out into a thin sheet, about 1/6” thick. Use a circular, 4” cookie cutter to cut out circles of dough. Place a small mound of the sauerkraut mixture into the center of the circle (reserve 2 cups of sauerkraut for the relish below), followed by about a teaspoon of shredded cheddar. Brush the edge of the dough with water. Fold the dough in half, keeping the filling tucked tightly in the center. Seal and crimp the edges. Gently transfer the pierogi to a lightly floured tray and cover with a kitchen towel. Repeat with the remaining dough to form all of the pierogies. Bring a large pot of salted water to a boil. Working in batches, boil the pierogies for a few minutes until they float to the surface. Use a slotted spoon to transfer them to a paper towel-lined plate to dry. In a large cast-iron skillet, add the bacon. Let the bacon render over medium heat until crispy. Use a slotted spoon to remove the bacon and set aside. Keep the bacon fat in the skillet. Working in batches, sear the dried pierogies in the hot bacon fat over medium heat until golden brown on one side. Flip them over and sear on the other side. Transfer the pierogies to a platter and keep warm. In the same pan you cooked the pierogies in, quickly add the diced rhubarb to the hot bacon fat, again over medium heat. Sauté for just a minute or two until slightly tender. Add in the reserved 2 cups of sauerkraut and heat through. Stir in the brown sugar, butter, fresh thyme, chives, and cooked bacon. Let the sugar and butter come to a bubble for a few minutes before transferring the relish to a bowl. 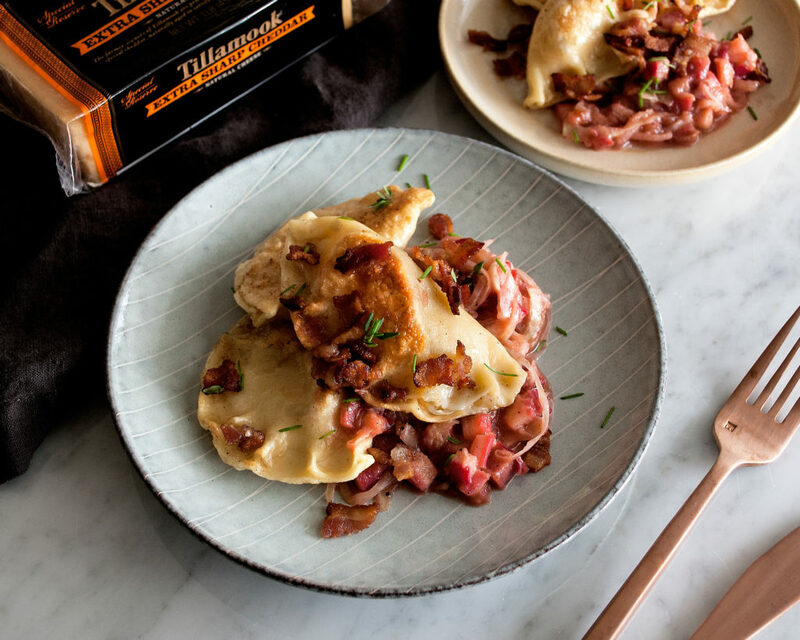 Serve the pierogies with a pinch of flaky sea salt over top and the bacon rhubarb relish as an accompaniment. I recommend making the full recipe amount and then freezing some of the boiled pierogies if you won’t need them all immediately. You can then defrost them in the refrigerator and finish them as instructed.